MerMEED investigates the processes responsible for the widespread dissipation of oceanic mesoscale eddies at western boundaries. The project combines focussed measurements of small-scale turbulence in four short research cruises, multi-year mooring and satellite observations, and multi-month glider surveys of mesoscale eddies impinging on the continental slope east of the Bahamas. Our aim is to observe mesoscale eddies when they encounter topography at the western boundary of the Atlantic. 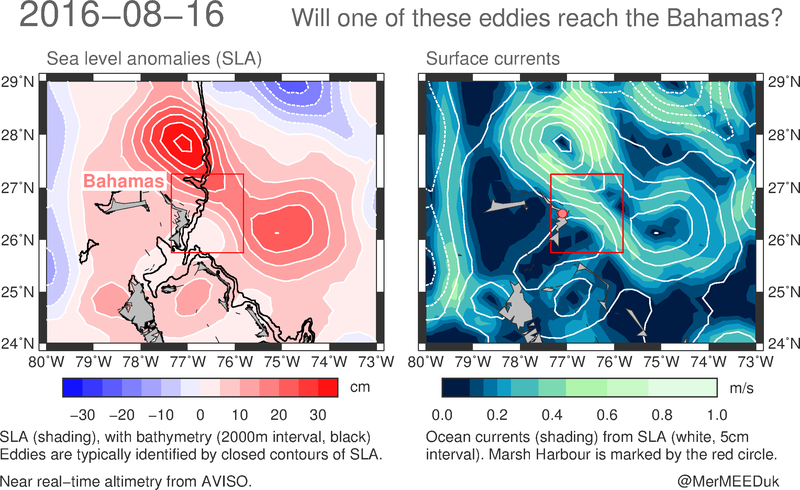 These eddies arrive sporadically (spaced out by a few months) so we are using sea surface height observations from satellites to get a look at what eddies are there and make short timescale predictions about when they'll arrive at the Bahamas. Below is an example of the near real-time satellite image from August 2016, a few months prior to our first field expedition. In the left panel, there are two red blobs indicating higher sea level that elsewhere. These are associated with clockwise-spinning eddies (anticyclones). The red blob to the right, further offshore, was the eddy that was sitting at the Bahamas during our first field expedition in November 2016. There are three main observational data streams for MerMEED. Additional instruments (thermistors and two 75 kHz ADCPs) were added to one of the RAPID project moorings in 1400 m of water east of the Bahamas, to make high time resolution (10s sampling on the thermistors) and high vertical resolution (every 50 m for thermistors, 16 m bins for the ADCPs) measurements at the edge of the continental slope where the eddies encounter topography. These were deployed in autumn 2015 and will be recovered in winter 2018. Autonomous underwater vehicles (Seagliders) make multi-month observations of temperature and salinity in the top 1000 m. These observations will give a detailed look at the changes in the subsurface structure of the eddy as it encounters topography. They can additionally be used to estimate turbulent dissipation through methods that are still under development. Together, these observations span the space- and timescales of mesoscale eddies down to 10-cm scale turbulent vortices in the water, to enable us to better understand the processes by which eddies lose their energy when they encounter topography.